Yesterday saw Accrington Stanley and Accrington Stanley Community Trust alongside the other 71 EFL Clubs come together to showcase the work they do in the community to help tackle some of the big issues that are effecting our community. 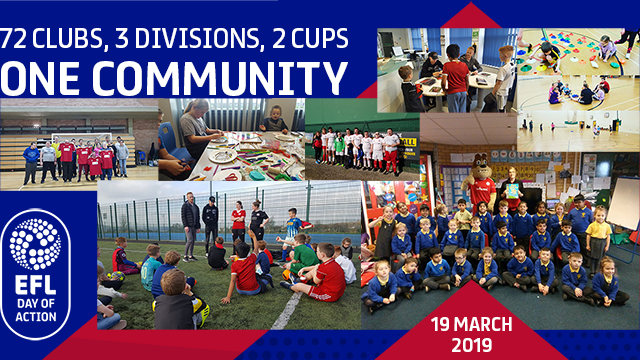 On Tuesday 19 March, clubs across the Championship, League One and League Two hosted events for the EFL’s Day of Action 2019, designed to showcase the very best of their work to tackle a diverse range of social issues, from homelessness and mental health, to community cohesion and the battle against plastic pollution. The Community Trust work with hundreds people in the local community daily to help educate and inspire them through sport. We marked the day by visiting local primary and secondary schools as well as delivering our disability junior sports session. Players from Accrington Stanley’s first team made a surprise visit to Benjamin Hargreaves after school football session. Luke Armstrong and Ross Sykes joined our coaches at Benjamin Hargreaves after school football session to surprise the participants and help coach the session.